It’s a common myth that acne only pops up in our teenage years, but unfortunately, it has the tendency to creep up well into our 40s and even 50s. Adult acne is a common complaint that can be persistent and difficult to treat. Adult acne can come on due to a change in hormones or even exposure to certain environments or for no reason at all. 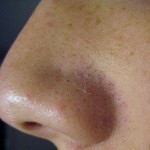 Adult acne is caused due to the accumulation of the normal skin pigment in oil gland ducts. However, there is respite from the problem too. It can be quite helpful to know that there are some really effective home remedies for adult acne that can help to get rid of it once and for all, leaving you feeling far more confident and blemish free. Mix equal amount of lemon juice and rose water and apply on your face with a cotton ball. Leave for half an hour and wash. Repeat for 15-20 days. Separating the yolk out may not be good for your cholesterol, but it is in fact good for your acne. This natural cure helps to get rid of the appearance of acne and help to diminish it faster than you can imagine. Try putting egg yolk directly on the site of the acne twice a day and see how this natural cure goes to work! Mix two tablespoons of yogurt with a half a teaspoon of baking soda. Wet your face with warm water and then use the mixture as a gentle cleanser twice a week. Apply tea tree oil directly to pimples using a cotton swab, and then leave on overnight. The Mayo Clinic states that 5 percent tea tree oil is effective against mild to moderate acne. Avoid using undiluted tea tree oil on the skin, as it may worsen inflammation. Mix 2-3 tea bags to some basil and cook in boiling water, for 10-20 minutes. Apply on the acne with a cotton ball. Apply sandalwood and neem powder, mixed with rose water, before bed and clean it off in the morning. Baking soda is often used as a natural anti-aging skin care ingredient because it acts as an exfoliant that scrubs away tough dirt trapped deep inside your pores. It is a proven blackhead eraser and gives your entire face a gentle but thorough cleaning. Oatmeal can absorb excess oil from the skin, and honey has antiseptic and toning properties. To make a paste, mix 1/2 cup of cooked oatmeal with 1/8 cup of honey and allow to cool. Apply the paste to oily skin and leave for 15 minutes. Wash with warm water. For acne that has left scars on your face, mix 1 tbsp sour cream (0% fat), 1 tbsp yogurt, 1 tbsp grind oatmeal and 3-4 drops of lemon juice. Apply on face, leave for 10 minutes and wash off. Boil water in a pan and add some apple cider vinegar. Cool, put a towel on your head and bend over the pan. Take steam for 15-20 minutes. Next story Have You Tried Curling Coils?